Every year I embark on a gingerbread project and this year I decided to make something a little more complex than the usual house that I churned out every year. After some browsing of what was out there in the internet I decided to take on the Eiffel Tower. First things first – you need a template. I downloaded one from here. The author of that website made his in 4 pieces but I decided to do mine in 12 by sectioning the Eiffel tower into 3 portions – top, center and bottom. Then, I traced it onto cardboard. Next, you need to make the gingerbread. I have been using the gingerbread recipe from here for my last few gingerbread houses very successfully – just eliminate the bicarbonate soda from the recipe so that the biscuit does not spread and retains its shape beautifully. 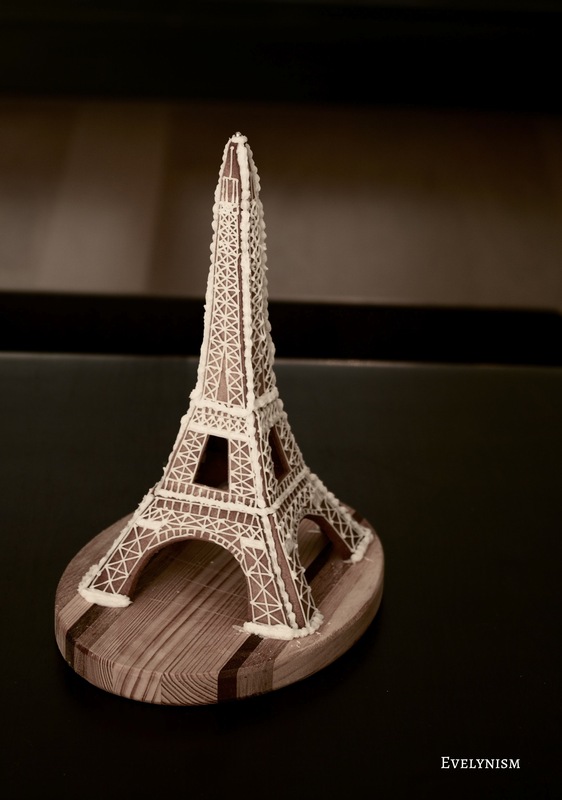 You will only need half a recipe to make this gingerbread Eiffel Tower but the excess can always be used to make cookies for eating – I don’t imagine you’d want to eat your tower immediately! 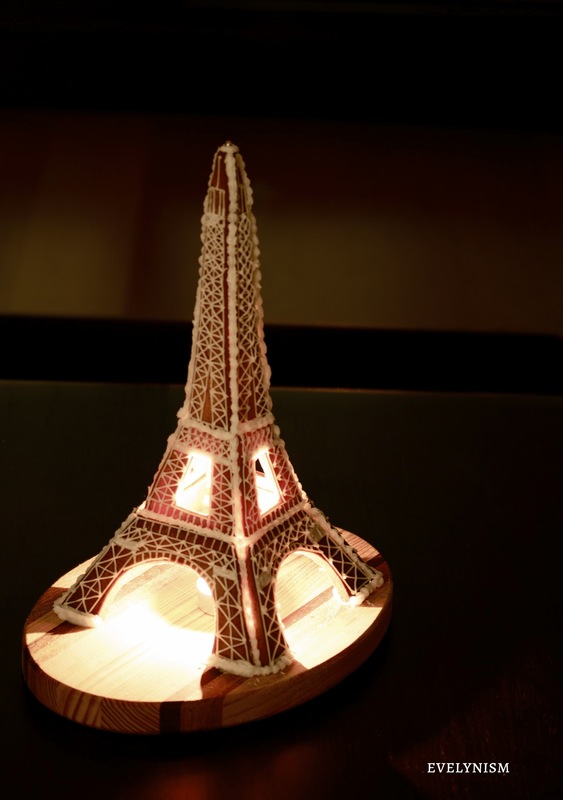 Now, you need to cut out the Eiffel Tower shapes – you will need 4 pieces of the top, 4 pieces of the center and 4 of the bottom – making it a total of 12 pieces. 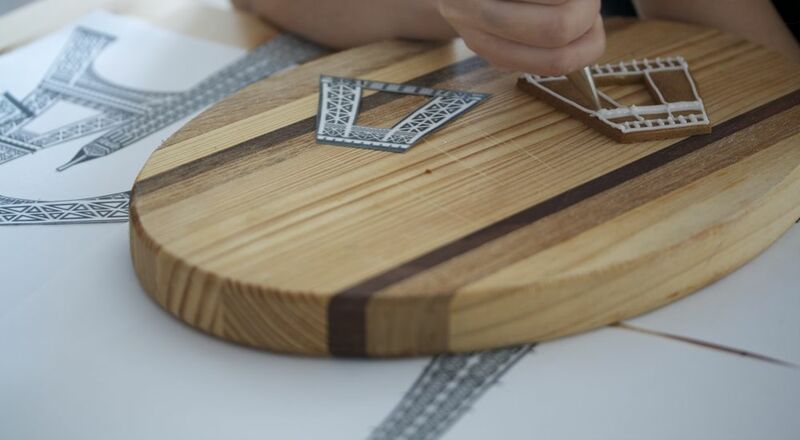 Use your cardboard templates to make sure they are all the same size and go around them with a sharp knife. 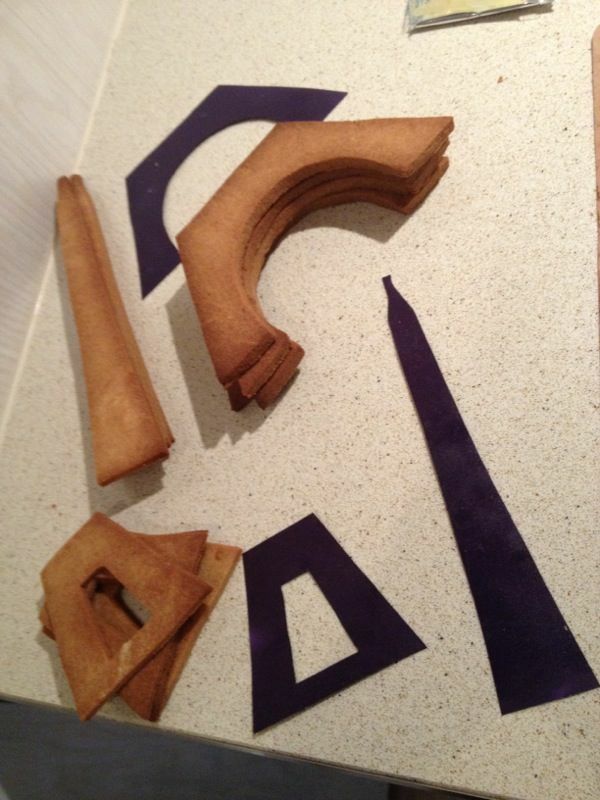 Bake them off – below is a photograph of my baked pieces. After baking comes the decorating! I used a no.2 round tip and royal icing for all the piping of the decorations. For the design, I copied the template as closely as I could, simplying the really tricky portions. For tips on royal piping, visit Sweetopia – there is a comprehensive and detailed list of tutorials there that you can read up on to learn all the tips and tricks of creating beautiful piped work. Then comes the challenging part – the assembly! I highly recommend that you have somebody to help you with this because it is very fiddly. Using royal icing, glue the gingerbread pieces together starting with the bottom layer, leaving it to dry for at least a couple of hours in between the layers. Continue on with the center pieces and lastly, the top. Below are photographs of it halfway through and then me at the final stage, supposedly smiling but the reality is I was holding the entire structure up with my finger inside the Eiffel Tower very gingerly. What do you think of my makeshift scaffolding? Finally, I did a shell border around all the seems to hide them and then it was all done! It took me the whole day from start to finish, but the results were worth it. It was not too difficult, just very time consuming – if you have made a gingerbread house before it shouldn’t be difficult at all. Below are photographs of it – Eiffel Tower by Day as well as Night. Hopefully this was helpful if you are looking to embark on this challenge! 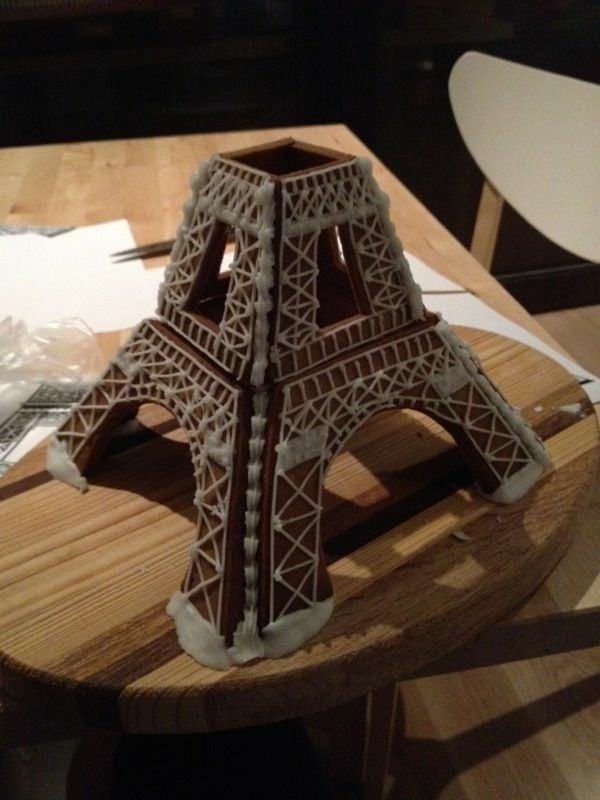 This entry was posted in Uncategorized and tagged eiffel tower, food, gingerbread, photography, recipes, royal icing. Bookmark the permalink. Oh I love it! I make a house every year and it’s getting more and more complex each time. Thank you 🙂 Yes – I’ve been building different things every year. Gets a bit addictive! et voila! (if only!) cheers to you and whoever else takes this on. your directions are easy to follow and encouraging to us who need it. Thank you! It’s actually not too difficult, just very time consuming. Definitely worth attempting. Oh my goodness this is the greatest thing ever. Thanks for visiting my site 🙂 What an impressive endeavor. It looks too beautiful to eat! Excellent job! Wow this is so good! I have never seen such a beautiful piece of gingerbread architecture before (I have only been brave enough to try cottages). Thank you 🙂 It is not much harder than a house to be honest – just more time consuming. Definitely suggest you try to build something different next time I would love to see it. I love your Eiffel! 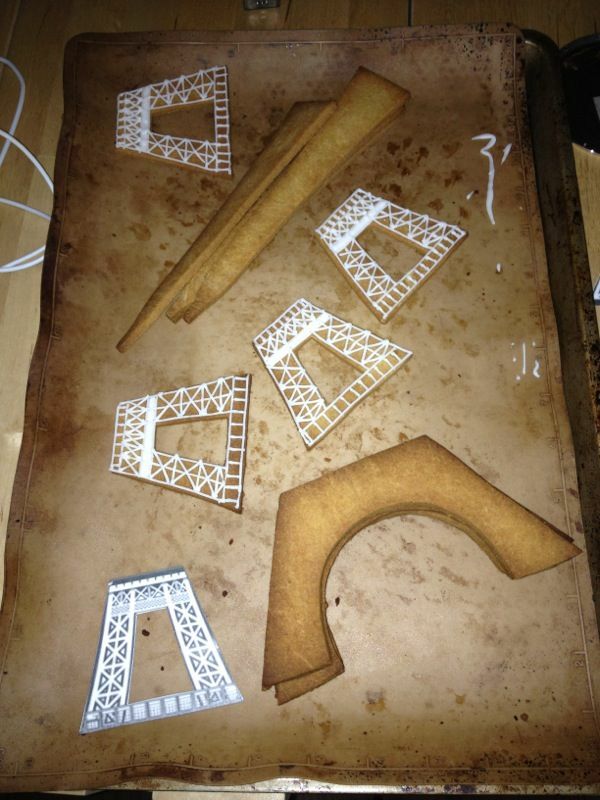 I recently bought a cookie cutter in the Eiffel shape in Paris. Thanks for the visit to my blog today. Oh my goodness! This looks amazing! I have never really tried doing a cookie creation but this is such a great idea. 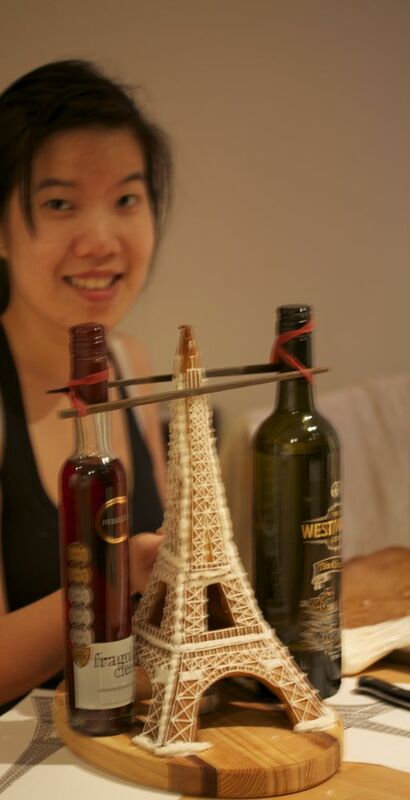 Thank you for liking my blog, I must say you are quite talented with being able to make the Eiffel Tower out of gingerbread. 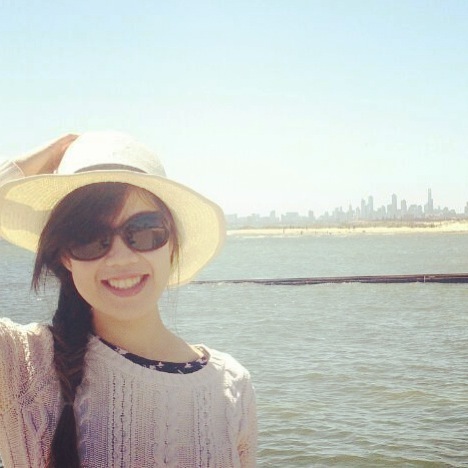 Great blog(s) by the way! Wow! That’s truly amazing. You are extremely talented! Truly amazing! You are incredibly talented!